I’ve had just about all the winter fun I can stand! We have snow. We have lots of snow and it keeps drifting back and forth. Every day it’s stacked up in a new spot. The snow can’t seem to decide where it wants to be. I think snow likes to check out several spots before it decides to stay put. It’s a theory I have. 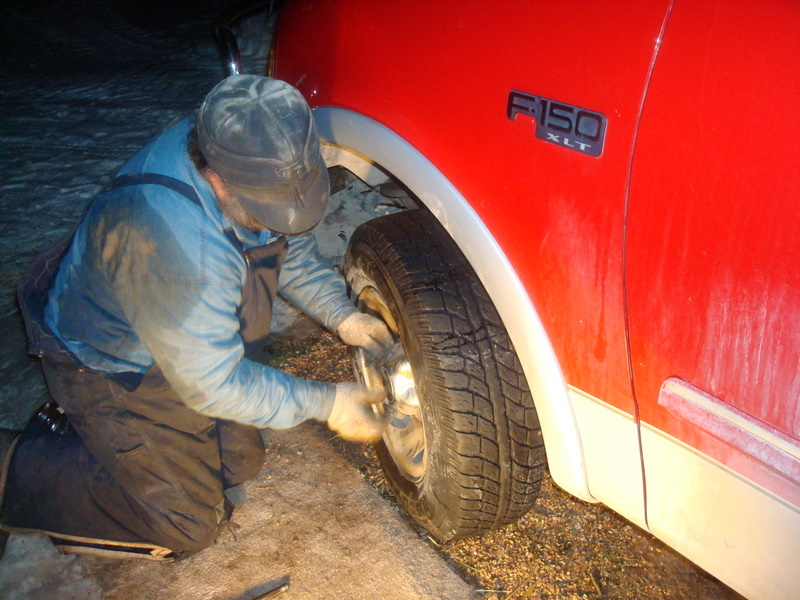 Monday night after work I got stuck in our driveway – in the snow that had drifted – with my 3/4 ton, 4 wheel drive pickup – on a cold and windy evening a half a mile from my house – I got stuck! Here’s my ride when it’s not stuck in the snow. I didn’t have a shovel or my Carhart coveralls or my snowboots or a hat or a decent pair of gloves. And the worst thing was that my husband wasn’t home to dig me out. Wahhhh!!! So… I cussed a little and then I walked through the herd of cows to the house, put on my coveralls, a hat, gloves and my snow boots. I found a shovel and walked back to my pickup. 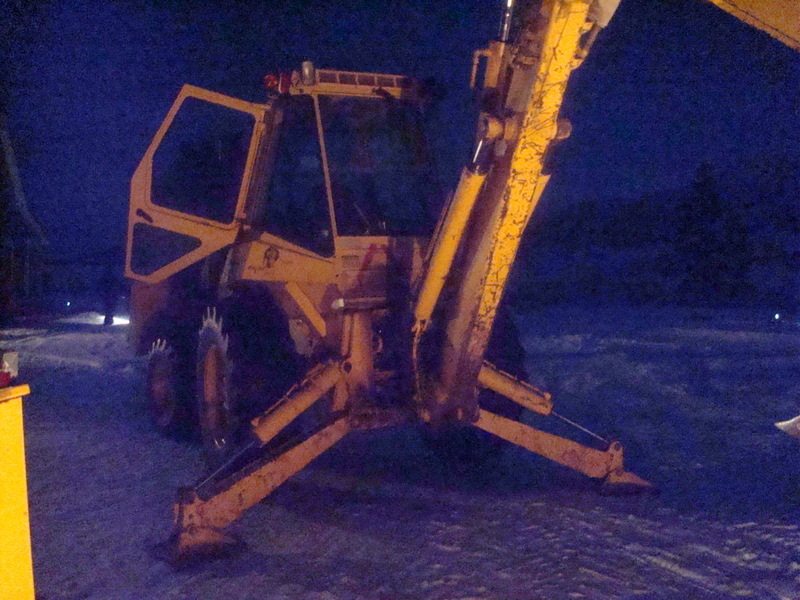 By then it was getting dark but I spent a half hour digging the truck out anyway. I drove it about 5 feet and got stuck again! So… I cussed some more, then I dug some more and this time when I got the pickup moving I turned off the driveway and cut across the pasture where you could almost see a patch of bare ground once in a while if you really looked. 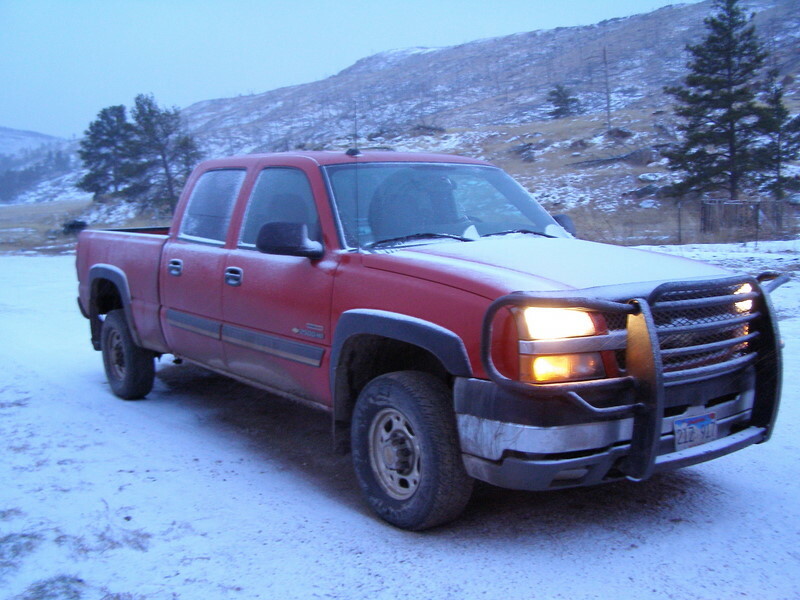 I followed a cow path, bounced over several frozen cow pies, hit the gas (or in this case – the diesel fuel) and finally made it to the house. Life is an adventure – go ahead and live it! That was Monday night. 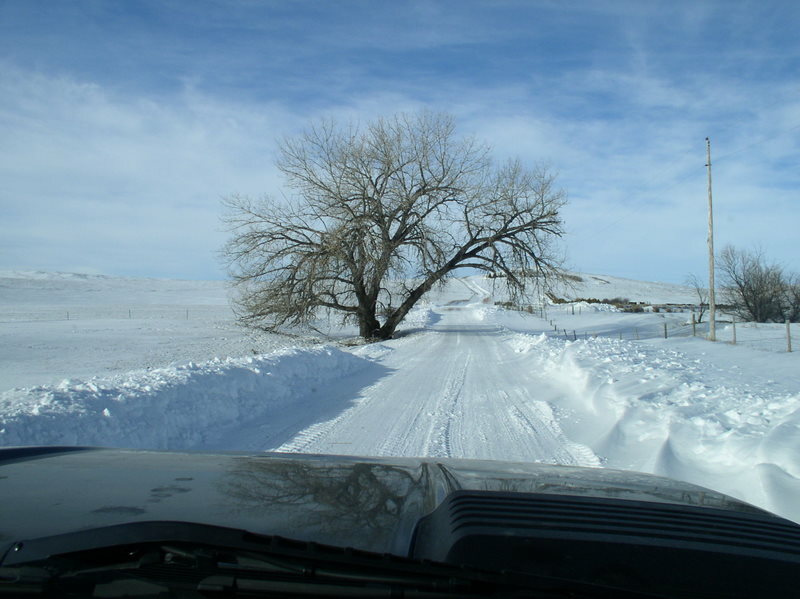 Tuesday night I made it home just fine because Hubby had been out plowing snow all day but as we were finishing supper the phone rang – the neighbor lady was stuck and her vehicle was stuck a lot deeper than mine had been. 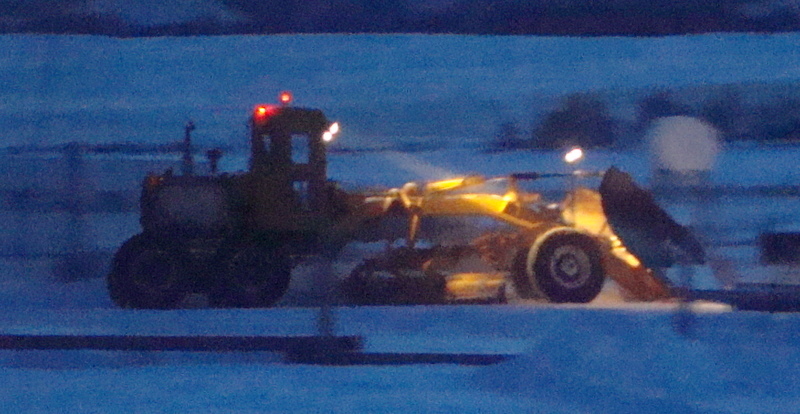 Hubby fired up the road grader and went to plow as close as he could. He plowed up one side of her vehicle and down the other, leaving her cute little SUV in an island of snow. I came with the pickup to help too. He plowed, we shoveled and then we jump-started her vehicle because the battery was dead by then and finally we chained it to the back of the road grader and pulled her out. She was very happy to be on her way. That’s the way things have been going around here. The scary part is it continues to snow. It just keeps coming along with the freezing rains, ground blizzards, drifting snow and frigid arctic temperatures. You just have to love life in the midwest. But if you don’t like the weather just wait 5 minutes and it will change. I keep telling myself spring is just around the corner – it has to be! I’ve had just about all the winter fun I can stand. And from the looks of it, these deer have too. They’ve decided to spend the rest of the winter right here, in the stack yard out of the wind with all these lovely hay bales. Pretty smart critters – aren’t they? I’ve been working on my New Years Resolution. You should be very proud of me – it’s only taken me till the 27th of January to get started on it. I picked just one resolution this year because it’s a big one and it will probably take me at least 37 years, 5 months and 13 days to accomplish it. I have vowed to organized every last photo in our house! I know – insanity runs rampant in my family but I have resolved to do this so I must get started. I decided it would be smart to start with the old photos – we have a lot of them – some from my side of the family and a bunch from my husbands’ family. When my father-in-law passed away a couple of years ago we ended up with 6 VERY LARGE boxes of photos, newspaper clippings and a variety of other documents that desperately need to be preserved so being the overachiever that I am I decided the best thing to do would be to scan them and make CDs for my hubbys’ brothers, cousins, aunts, uncles, nieces, nephews, grandchildren, 2nd cousins twice removed and any neighbors and total strangers who want one. I can be so ‘Martha’ sometimes. But tonight, before I even looked into the first box of my husbands’ family photos I found this one in my grandmothers’ old photo album. This is the Meyer School. It is where my grandmother – Lulu taught before she got married. 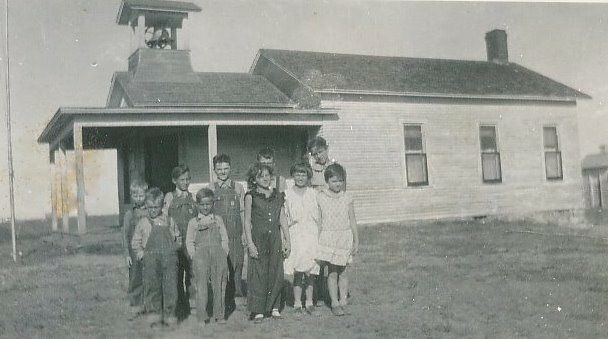 It was 6 miles from Huron, SD and these are the children who went to school there in 1934 – 1935 (at least that’s what it says on the back). Since I was born in 1961 I don’t think I know any of these kids but I do know the school. It was called the Meyer School because the Meyer family lived right across the road from it and I would bet real money they had a lot to do with building it. This is where Lulu was teaching when she met my grandfather, Russell. He was very handsome and he drove the horse-drawn road grader pulled by his team of horses back and forth in front of the school. I’ve heard he spent a lot of time grading the road in front of the school. In fact someone once mentioned that he just about wore that stretch of road out in front of the school. I’m sure it was just because he took his job very, very seriously and that stretch of road must have needed work very, very badly. Yeah – I’m sure that’s why he did it. Here’s a photo of Grandpa Russell and Grandma Lulu on a date. Exciting, isn’t it? Grandpa really knew how to show a girl a good time. Look at her. She’s just about to throw her arms around his neck, kiss him passionately and roll around in that field of rye with him – isn’t she? 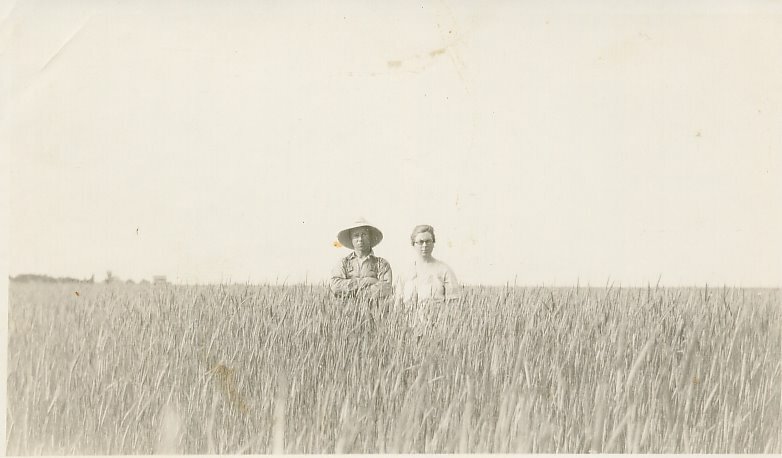 But Grandma married him anyway and she moved to the sod house at the farm 1 mile from the school. My Uncle Don and my father, Jim were raised there and eventually both were students at the Meyer School. They married nice, young gals and raised their families next door to the home place (also 1 mile from the school). My brother, sister and I grew up on the farm and when we got old enough to go to 1st grade this is where we went too. I only went to country school for 2 years but I have some vivid memories of it. My cousins were students there too along with the kids from several families near by but there were only 2 kids in my grade – a boy named Roger and myself. He was weird. We didn’t have running water just a cooler that was filled every day and placed on a table in the small coat room just inside the door. It was cool. Because there wasn’t running water we had 2 outhouses out back – one for the boys and one for the girls. They were cool too – especially in the winter. One day I went to the outhouse and found a huge garter snake stretched out and soaking up the sunshine in front of the door. I just about peed my pants right then and there. I ran back inside and told our teacher who quickly sent my big, strong and incredibly brave cousin, Marla (with a baseball bat in hand) out to take care of the snake. The poor little snake must have been just as scared as I was because he disappeared before we got back. We played lots of baseball during recess and rode the merry-go-round and swings too. And we would take turns ringing the bell when it was time to come in. I distinctly remember a Christmas program where I had to recite a poem. I was scared spit less but got through it without too many prompts from our teacher. If I remember right. I hadn’t thought about that for a long time. Isn’t it great how old photos can bring back all those memories? Unfortunately, I now realize I’ve just spent the last 2 hours reminiscing and have only scanned 2 photos. I guess you better add a couple more years onto my timeline for this years’ resolution. Help me Martha!!! I had to bring the ladder inside to change some light bulbs so I thought I would take a couple of pictures while I was up there. 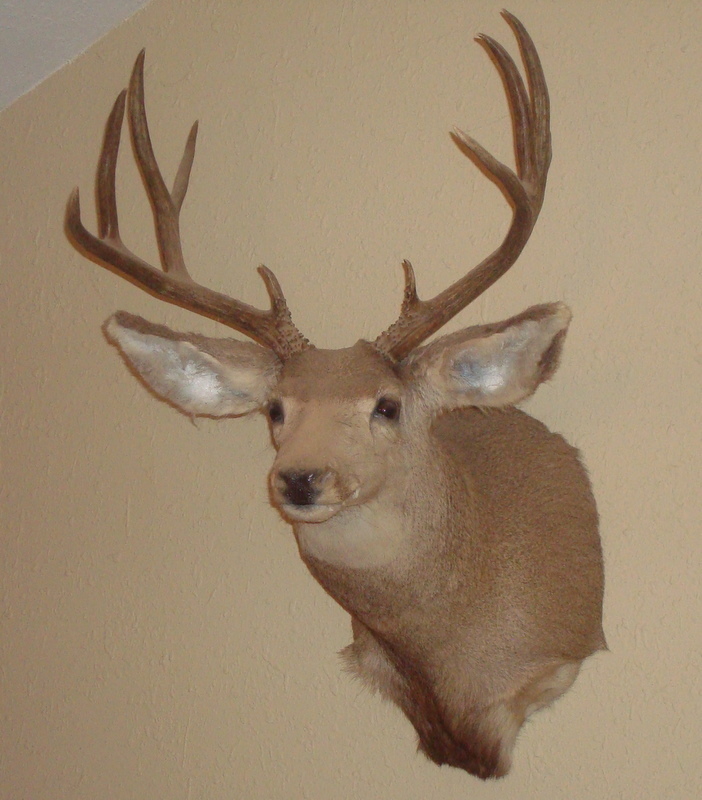 Unfortunately, there wasn’t much to photograph ‘up there’ so here are some pictures of the deer heads that grace our walls. I’m sorry – it’s been a long winter and we’re rednecks. Surprisingly, each deer has a pretty good story. 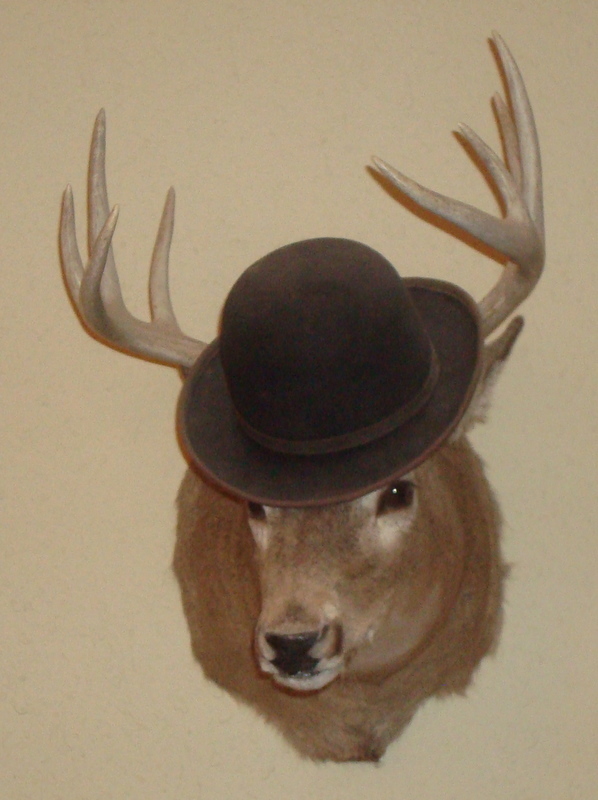 This is a mule deer. He was eating hay in our stack yard on the opening day of hunting season – not a wise decision on his part. You probably remember this guy from a previous post. My husband shot this one while he was standing on the front porch in his underwear (my husband – not the deer). I have a video of this. You will never see stuff like this on a TV hunting show even though it was pretty darn funny. and our dog, Barney got that set. Now before you get all up in arms (pun intended), let me explain. 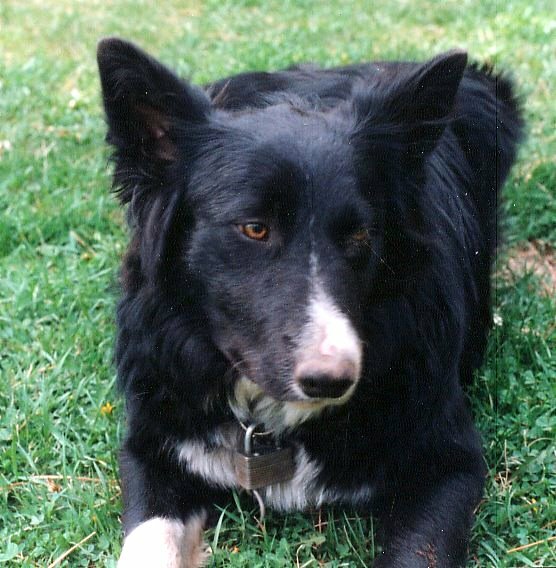 Barney the Border Collie was a lover, not a fighter. His greatest joy in life was baby chicks. Barney LOVED baby chicks! He never hurt one – in fact Barney was the best mother hen we had. If you’ve ever been around Border Collies you know they have to have a job. They are working dogs. They will herd cows, horses, sheep, goats, pigs, children, cats, balls and all manners of fowl. Barney’s life revolved around baby chicks. Every spring when our hens hatched out their babies, Barney was a nervous wreck. He would go from one batch of chicks to the next, round and round till he was exhausted. He loved baby chicks so much that when our hens weren’t setting I would buy chicks just for him. I would come home with a box of little cheepers and as soon as he heard them he would get so excited he could hardly contain himself. He would sleep beside their pen and never leave them till they were about half-grown. Barney was a great dog. But I’ve gotten sidetracked – the deer horns. One year both our boys had hunting licenses. 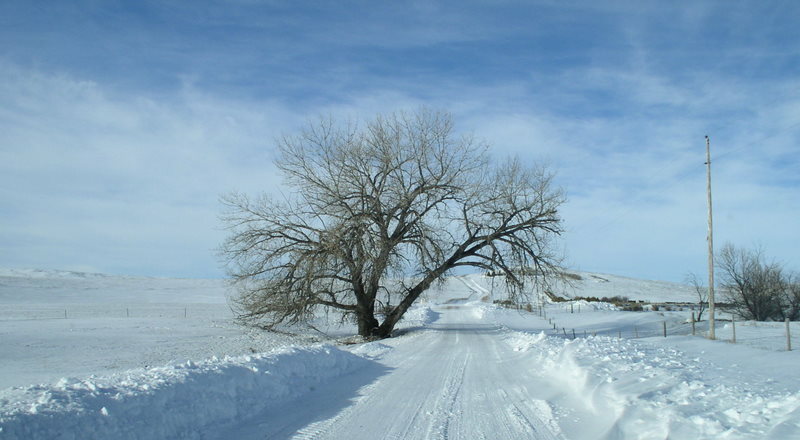 We lived near Custer, SD at that time right up against Custer State Park. The park fence ran for about 3/4 of a mile along the edge of our property and both boys knew the rules of hunting – anything on the other side of the fence was off-limits. There was no hunting in the state park! But that was OK. There were usually enough deer on our property that there was no reason to even look across the fence – except for that one white-tailed buck. He was beautiful. Not a big rack but well-formed and both boys set their sights (so to speak) on getting him. But it wasn’t as easy as you’d think. He was smart! There was a spot in the park fence where it crossed the creek that the wire didn’t quite reach the ground leaving just enough space for the deer to duck under the fence and come onto our land and the big meadow full of tall grass. All season the boys tried to catch the buck on our land but no matter how quietly they snuck out of the house, gun in hand, he heard them and would scoot back under the fence to the park where he knew he was safe. After a couple of weeks of failure, the boys put a tree stand up in a pine tree then spent hours waiting for the buck but not once did he pass under the fence while they were outside. Barney was just as excited as Dalton and he wagged his tail in delight before disappearing into the tall grass, his nose to the ground. Dalton climbed the tree, unstrapped his tree stand and lowered it to the ground. He turned around to whistle for Barney only to find the dog standing right behind him, his tail wagging in delight and a deer skull clenched in his teeth – the antlers coming up on either side of his face. It just about scared the beejeebers out of Dalton. He was half way up the tree again before he realized it was only Barney and not some blood-crazed devil-like forest creature never before seen by human eyes. Dalton followed Barney under the fence and back into the trees to the spot where the remains of the buck lay – obviously the site of a mountain lion kill. The boys couldn’t catch him but the big kitty did. Needless to say Barney won the ‘Big Buck’ contest that year and if dogs could talk you could bet Barney would have had one thing to say. I work for the US Department of Agriculture and I love my job not just because they pay me and I get cool benefits like paid vacation and health insurance (which I really like) but the main thing I like about my job is that I get to visit with ranchers every day. Ranchers come in all styles and shapes. and ranchers straight off the ranch with mud and manure encrusted coveralls and 4 buckle overshoes. 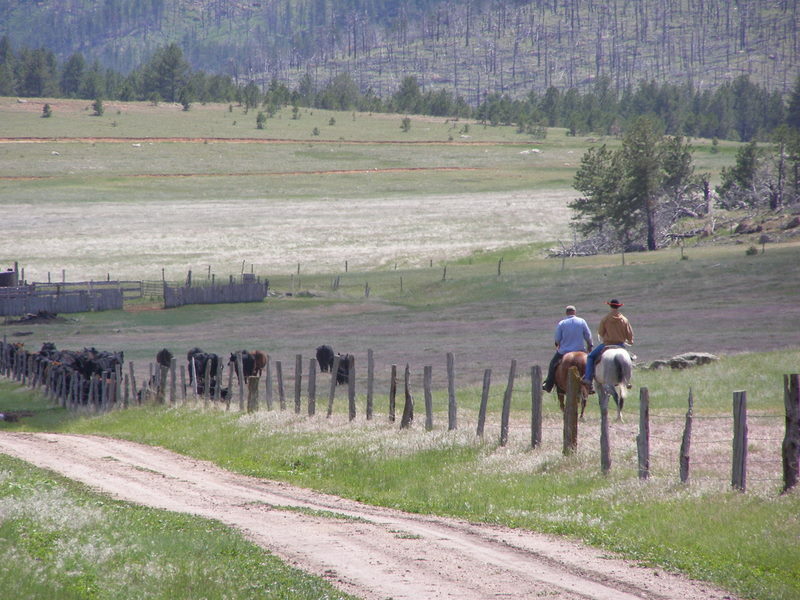 Ranchers are honest, hardworking people who will give you the shirt off their back – they are good people! Now, unless you’ve worked cattle you may not understand this statement or that it is a complement. It sounds more like something you could get arrested for at Sturgis during the motorcycle rally, but it’s not. Twistin’ tail is what you do when your moving cattle through alleyways or chutes. It is a delicate (Not!) maneuver that can get you kicked big time. The first thing you need to know is you can’t do it half way – jump in with determination and no fear or don’t even attempt it. You come up behind a calf (always practise this with calves before attempting it with full-grown cows), press your body hard against the backend, grab hold of the tail and twist it up into a furry, manure caked corkscrew and then push for all your worth. 1. You will get kicked, so stay close to the calf. The closer you are – the less it hurts. When your right up there ‘in their business’, so to speak, they just can’t get the right momentum to give you a good swift kick in the knee cap. If your backed off from them, even just a little, they can reach right up with their back hooves, kick you in the jaw and drop you to the ground. 2. 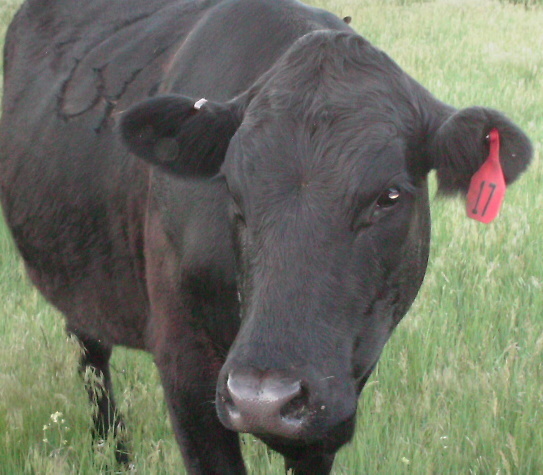 Cattle, in general, have no pity. If they see you go down they will turn on a dime and run over the top of you to get as far away from the chute as possible. They will even laugh at you as you wallow around in a foot of mud – they are mean that way. 3. And finally – sooner or later what goes into a calf must come out. Never wear good clothes or new gloves for this and above all do not tuck your pants into your boots – take my word for this. By the time you perfect this maneuver you will have manure down the front of you, in your face, in your hair and down your pants. 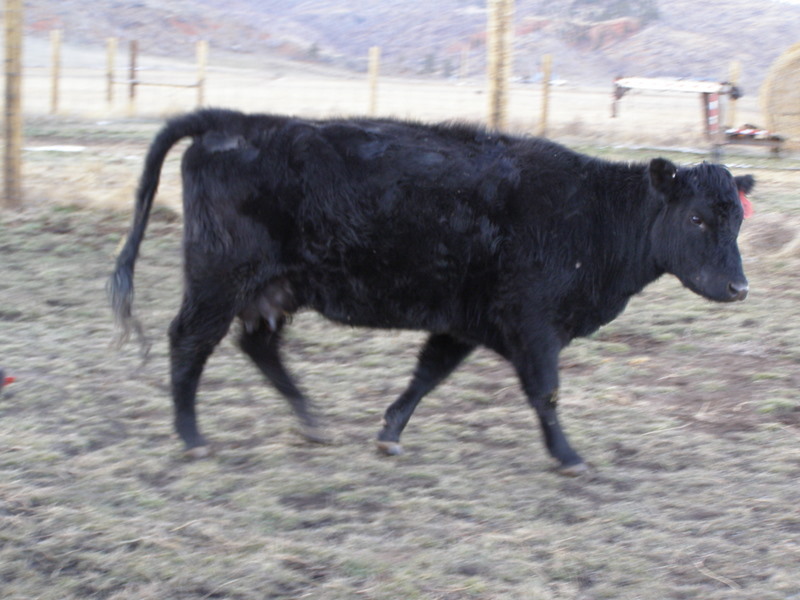 One word of warning – if the back-end of the calf is already covered with a slimy, yellowish substance known as scours (or diarrhea) do not attempt to twist that tail. Use a whip, sorting stick or hot-shot to keep at least 5 feet of distance between you and the backend of that calf – take my word for this too. I challenge you to use this quote today. Just see how many times you can work it into a conversation with your hair dresser, lawyer, priest, dentist or just the nice old lady who lives next door. I guarantee they will either be impressed with your way with words or just walk away with a troubled look on their face. Either way you’ll get a good chuckle out of it. My sister and I are curlers. No – not the kind you put in your hair – the kind you find on a sheet of ice. Look – here’s a couple of curlers now. That’s my sister, Jenny and Jeff – the only guy on our team. 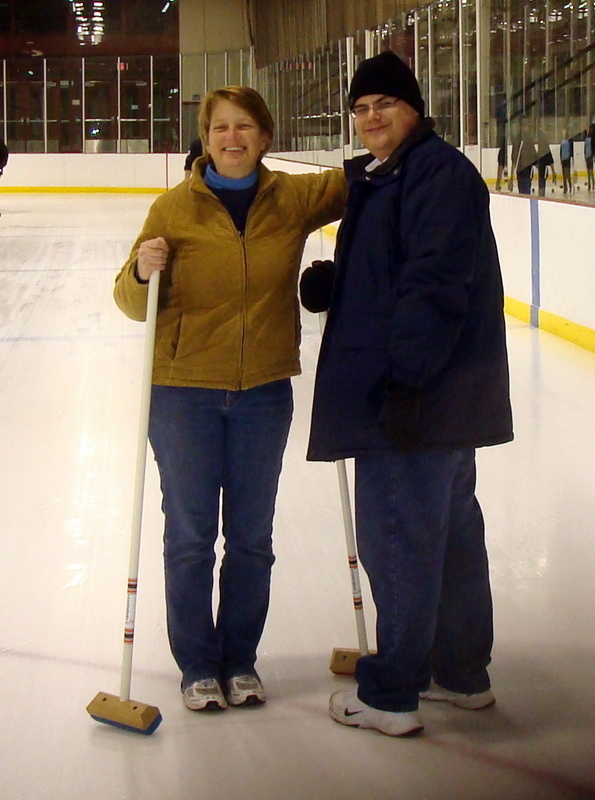 We just started curling last year and it’s a blast!!! Sure, you slip and fall once in a while but nobody points and laughs because they’ve been there too. And besides – every time I laugh I slip and fall too. 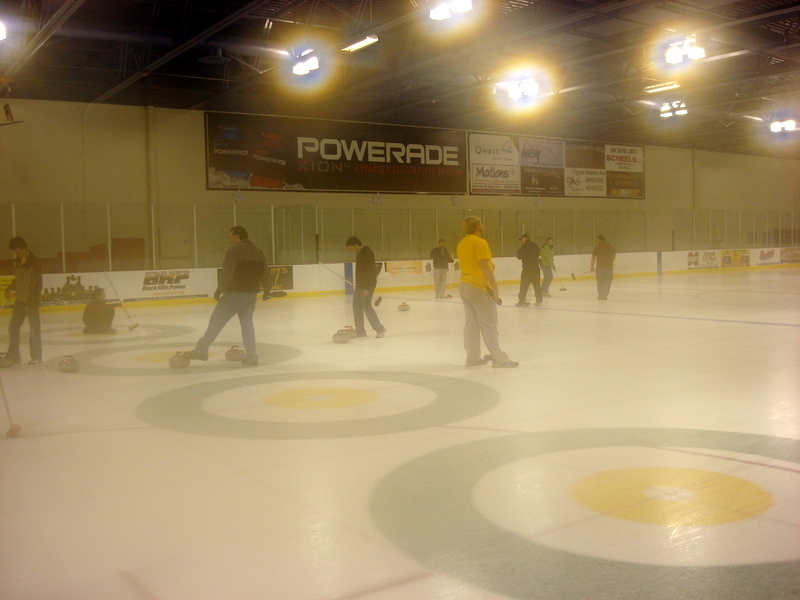 Here’s the very nice ice rink in Rapid City where we curl and some of the stones. Here’s some really good curlers. When I grow up I want to curl just like they do and I want a pink broom too! There are enough people signed up this year to have 8 teams. 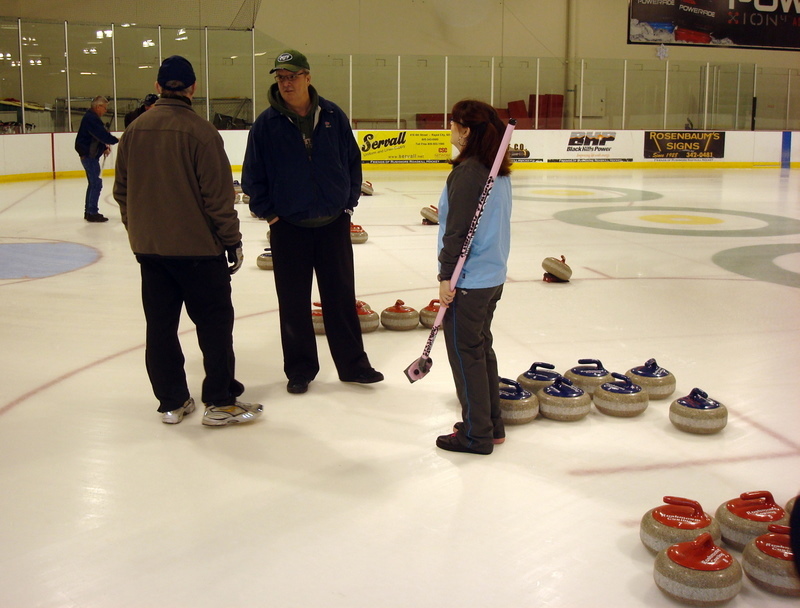 Most of us are beginners but there are a few who have been curling for years and they are great about helping us beginners out. Here’s Jenny as the alternate skip (the strategic master who tells us where she wants the stone) in the house (the target on the ice where we try to put our stones). Wow – it almost sounds like I know what I’m talking about. 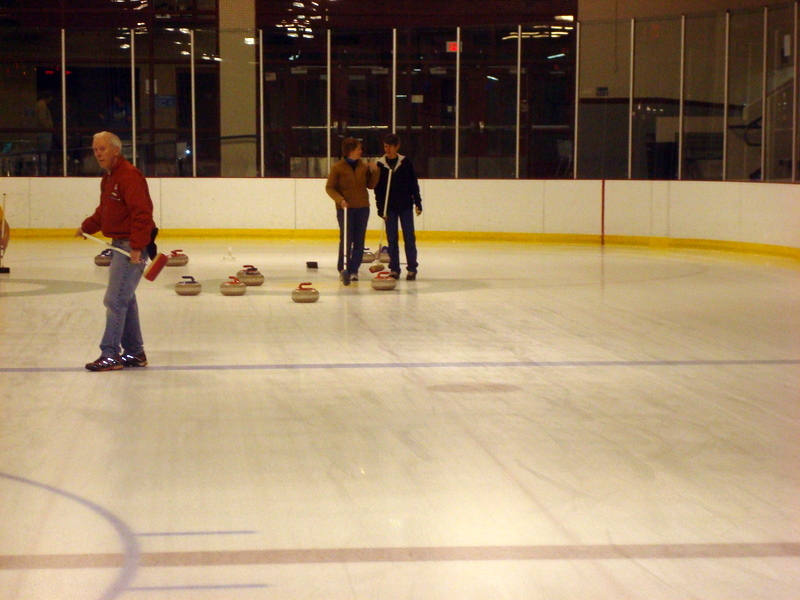 This shot looks pretty good – there are lots of rocks in play but the ice was really weird that day and no matter where you tried to put the rocks they usually just went off to the left. I’m not just making excuses – everyone on our sheet (patch of ice) was having the same problem. It wasn’t just me. Here’s what happens when you put your camera in your pocket and it gets all fogged over. Adds a bit of mystery to the whole thing doesn’t it? What do you think – it could be the beginning of a top-selling murder mystery – ‘Murder on the Rocks’ or maybe ‘Murder’s Just a Stones Throw Away’. OK, I’ll work on it. 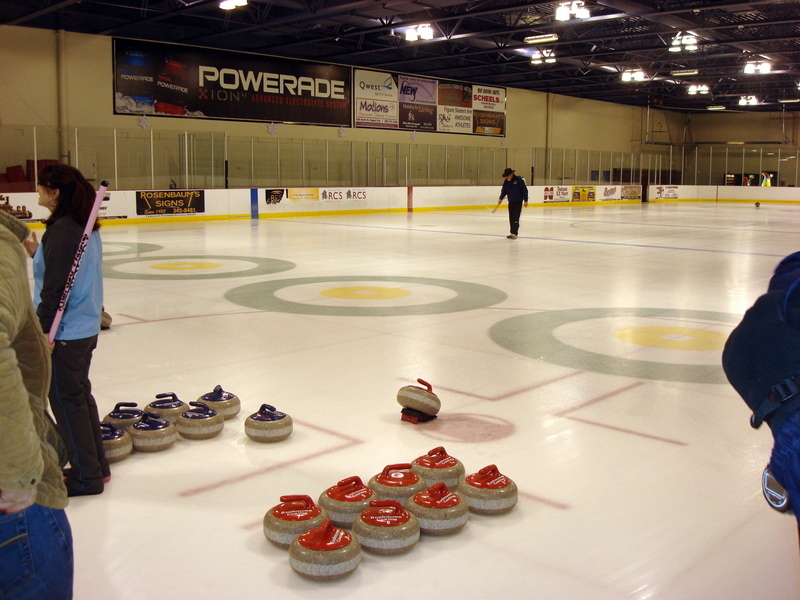 I love curling – it’s too much fun! When you live on a ranch Date Night could be just about anything. Saturday night Hubby and I went out and did something I have never done before. It was a beautiful evening with the nearly full moon adrift in a sky full of clouds. 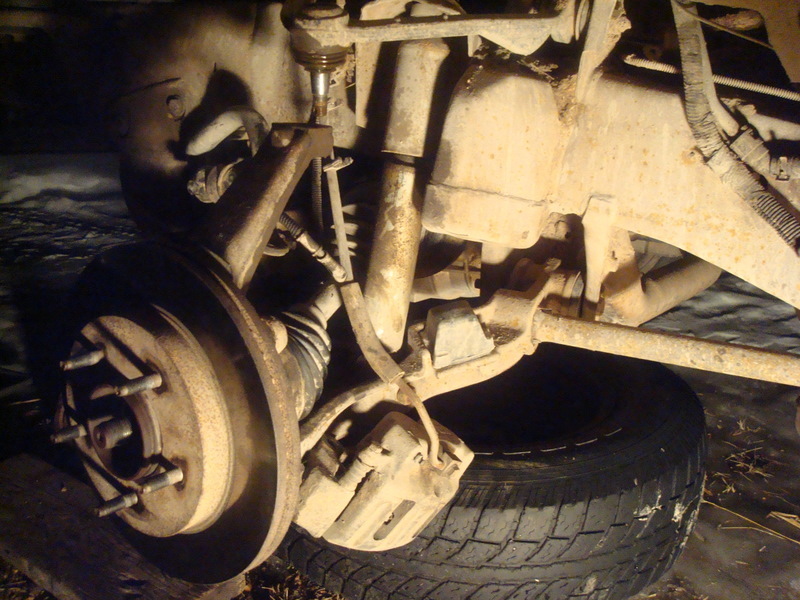 OK, we went out to the back yard and changed the ball joint on the old Ford pickup. Here’s what the poor girl looked like. This time of year you almost always run out of daylight. 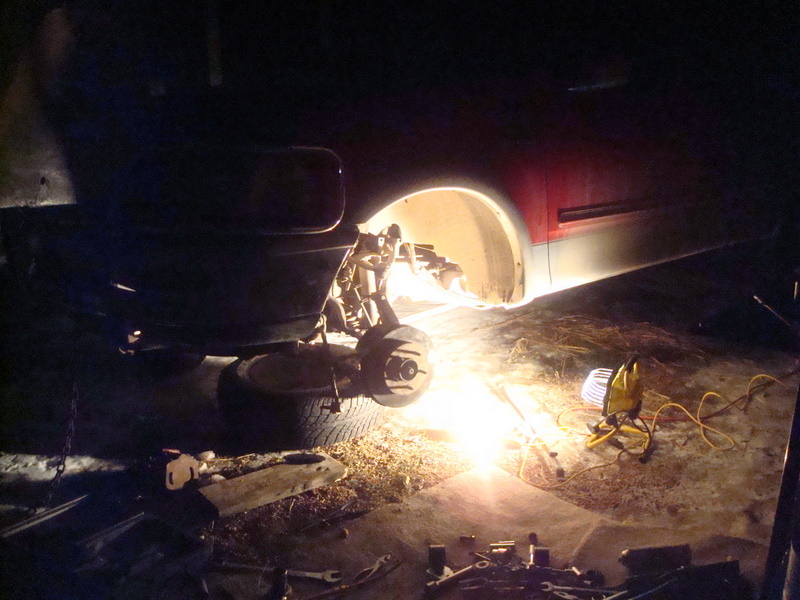 The ball joint was completely trashed – there was nothing holding it together but a wish and a prayer. You can see the shiny new one at the top of the picture. I love this truck. She hauled my babies around for years and then she took my kids to school when they were old enough to drive. In fact they started driving this pickup down to the school bus stop (a mile from the house) when Dalton was around 9 or 10 years old. There are a few dings and dents and those wild children of mine even got in trouble a couple of times in her. I know your shocked that my sweet babies would ever do anything to get in trouble – but it’s true. Overall, she’s been a great truck. I rolled over 190,000 miles on my way to work last week. I stopped on the side of the road, danced a little jig and whooped at the top of my lungs. The only ones who saw me were a couple of deer and a bald eagle flying overhead and none of them even noticed. Makes you wonder if there aren”t more crazy ranch wives out there that do this type of thing – doesn’t it? Still, it’s a good thing I live out here – if I did that type of thing downtown of some big city they would probably lock me up. Here’s the jack we chose to use – not your typical handyman jack. What’s that they say? Go big or go home. 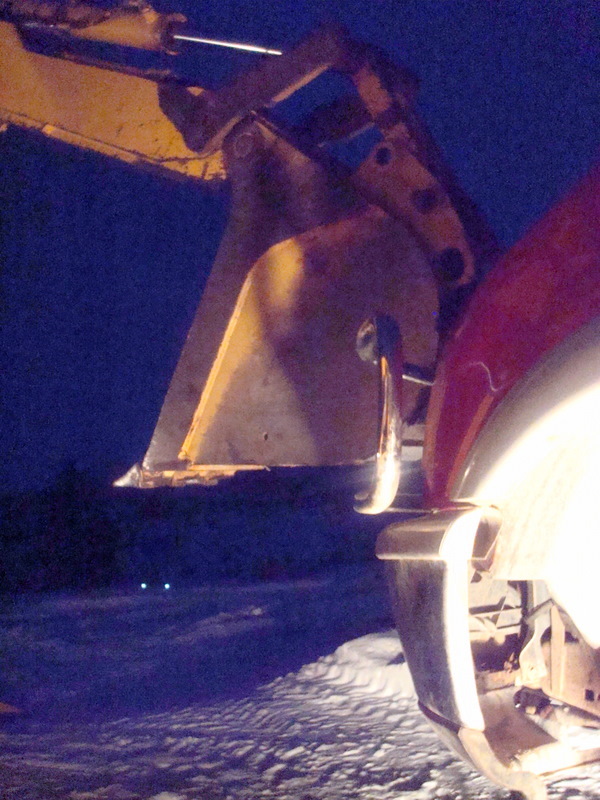 Why mess with those little ‘screw up’ jacks when you can hook a chain on the bucket of your handy-dandy backhoe and have an instant jack that can lift the whole front of your pickup off the ground? 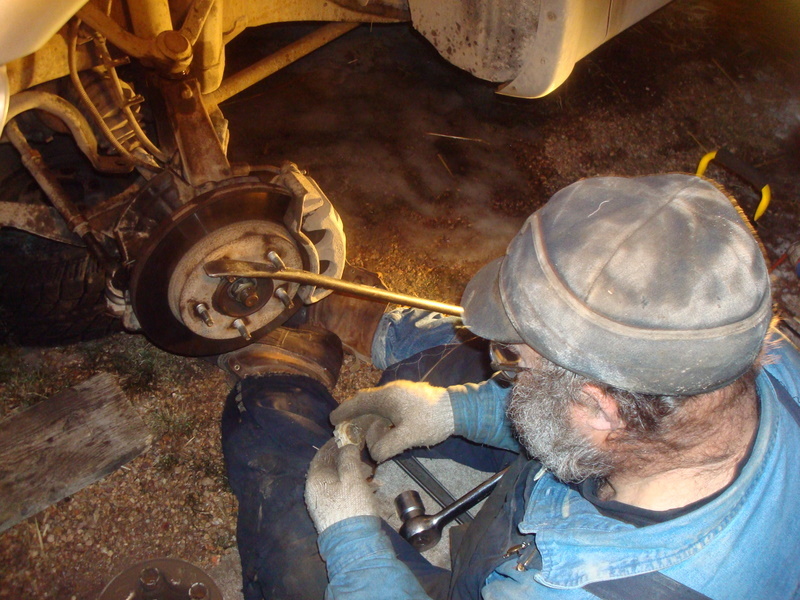 And here’s Hubby putting on the nut that holds everything together. 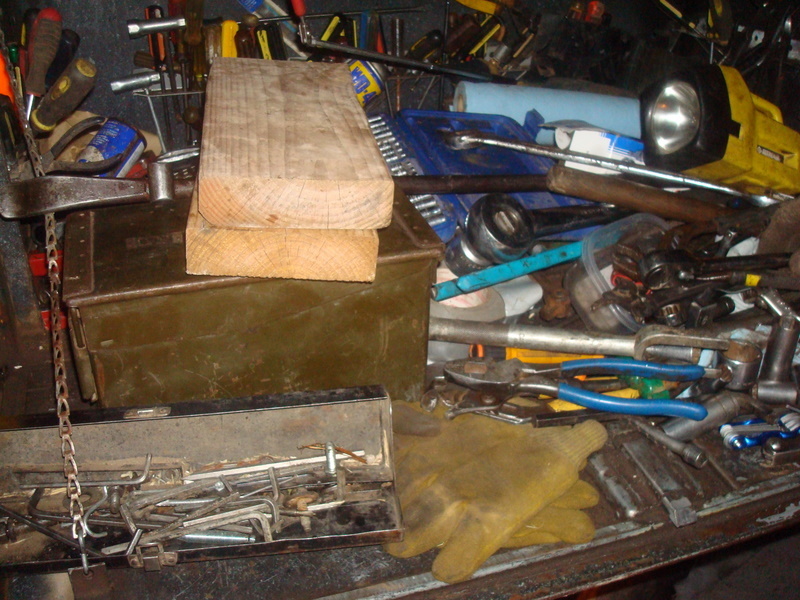 And here’s one of the compartments on the tool truck – a masterpiece of organization (and yes, the rest of the trucks compartments looks just like this one). Never fear – Hubby knows exactly where everything is! A few lug nuts and she’s done. Thank goodness – I was starting to worry about the old girl. Now if someone would just vacuum the dog hair and 3 gallons of spilled oats out of the back seat, take the spare parts, fencing materials, baling twine and tools out of the bed, sweep out 10 years worth of dust, mud spatters, old food wrappers and dirt from the cab and use harsh chemicals to remove the black, greasy buildup on the door handles, steering wheel, seats and ceiling liner – I would drive her to work. And someday, if your driving through Wyoming and happen to see a crazy ranch wife dancing a jig on the edge of the road beside her red Ford F-150 pickup – just smile and wave as you pass. You can bet I’ve just turned over 200,000 miles. 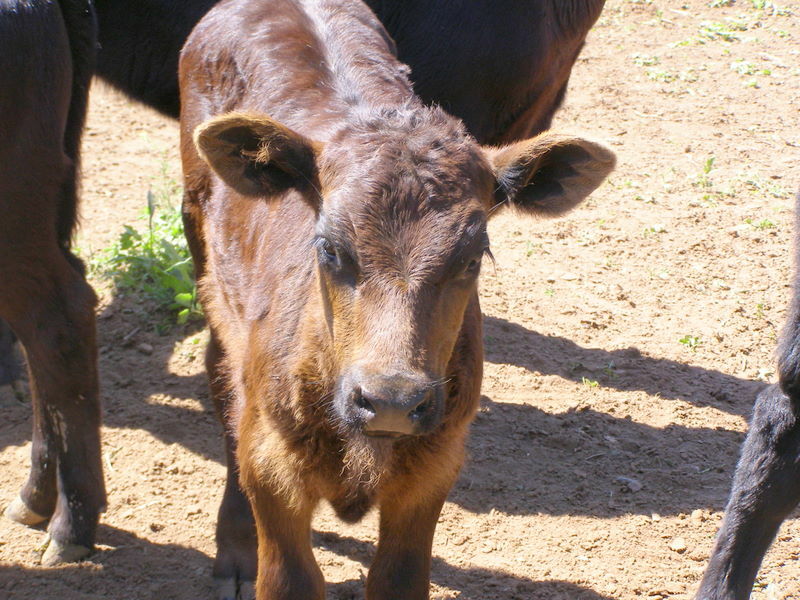 So, needless to say, most of our calves look like this. But every once in a while we end up with an odd colored calf. In 2009 we had Snowball. 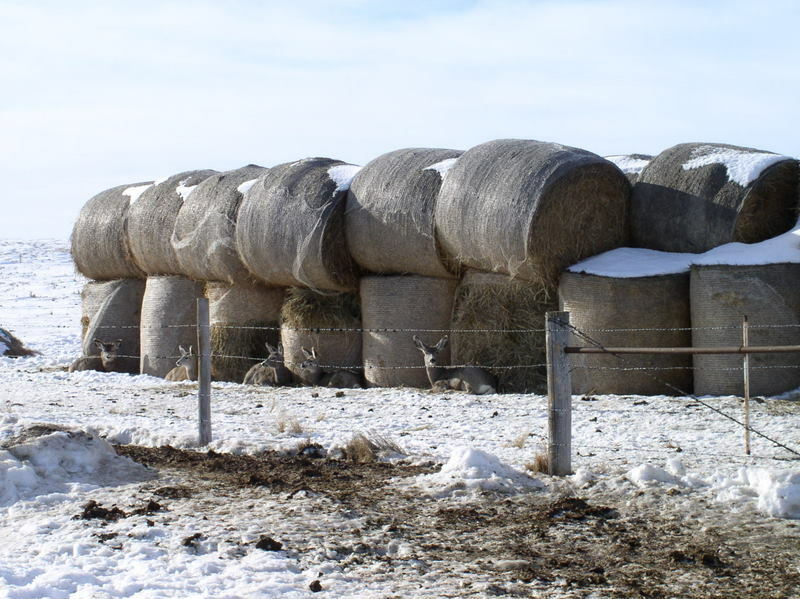 Actually the big feed lot operation on the other side of the mountain from us runs Charolais bulls – big, white bulls. Not even Earl, the horse knew what to think of this calf – even though he really did like the color. Sorry, Snowball – just because you’re a little different that doesn’t mean we’re going to treat you different then the other calves. After all, we wouldn’t want you to develop some debilitating complex where you feel singled out from the crowd and all alone. And we really wouldn’t want you to think your special and get spoiled or anything like that. I’m just saying – it could really ruin your life. So it’s better if we treat you the same as everyone else. In the chute you go. And look – we just happen to have a cowboy or two. 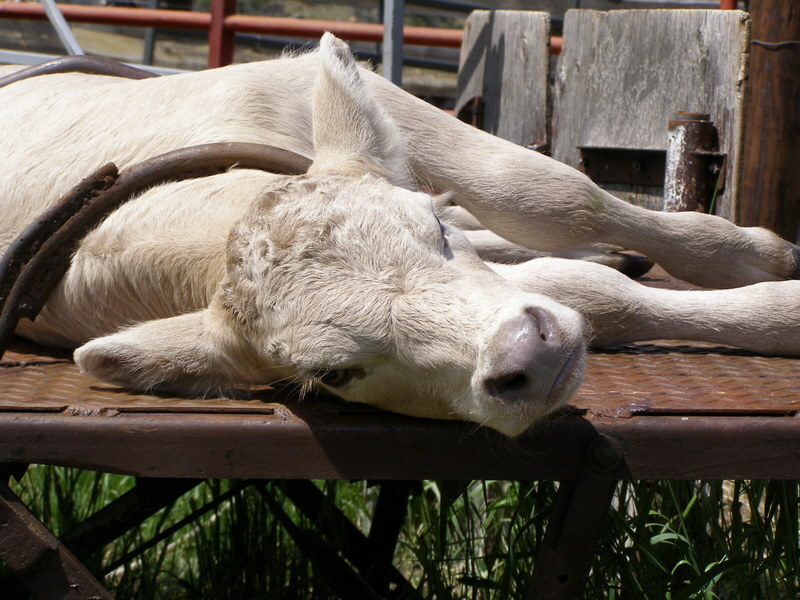 Snowball is laid out on our calf table. 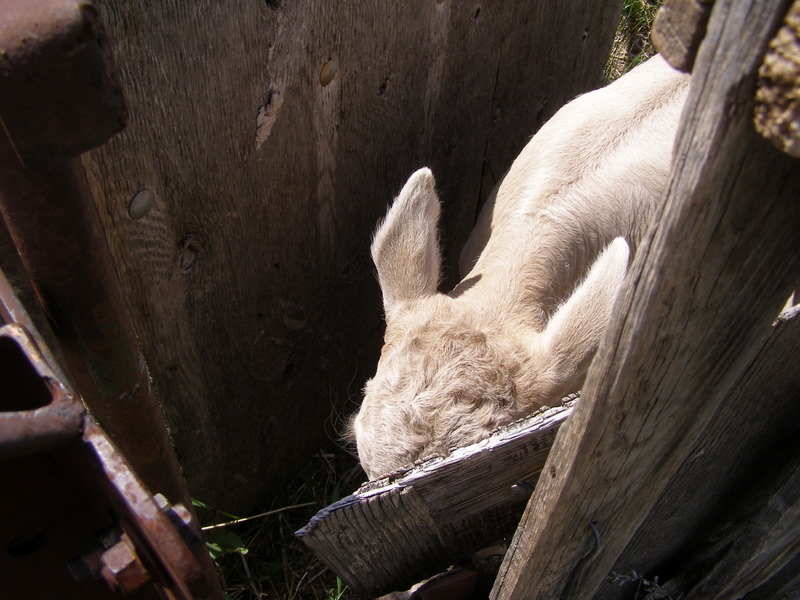 The calf table is usually closed into a narrow alley way. 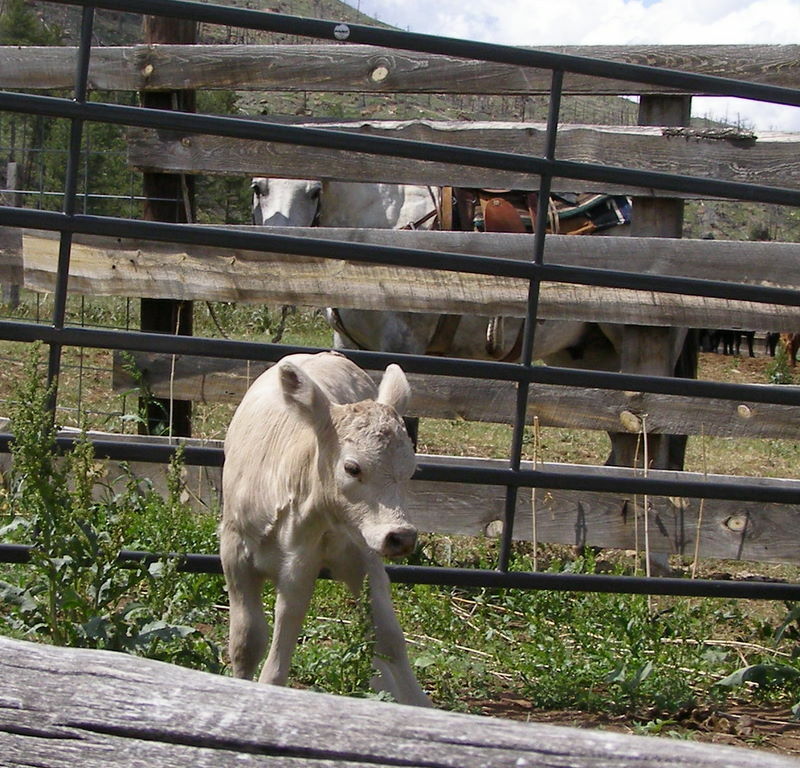 You run the calves into the little chute at the back of it and down the alley way to the three bars at the front. With levers, you lower the bars around the side and neck of the calf, sucking the calf up to the wall. Then you flip the wall and calf over onto its side – hence, the calf table. 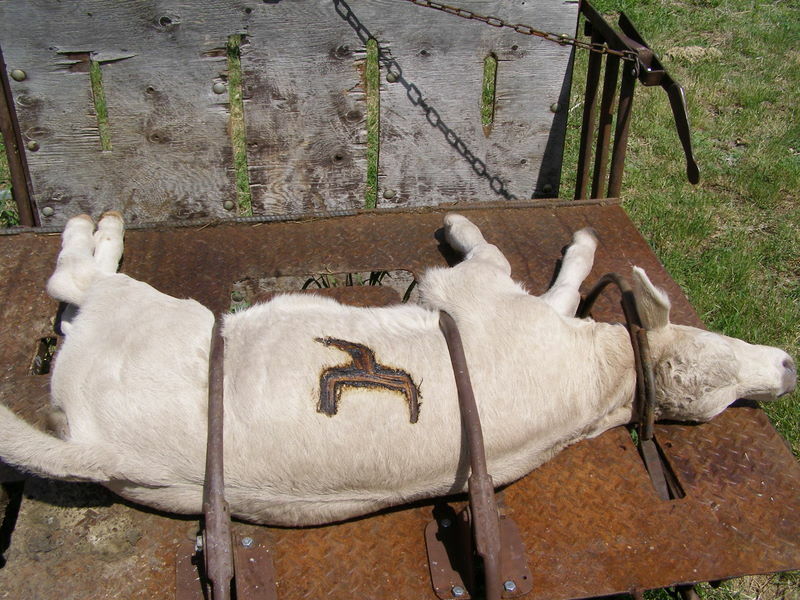 It’s handy for branding, castrating, ear tagging and just general all-around working on calves. And when your done you flip them back over onto their feet and release the bars on their side and they run out the front – back to mamma. 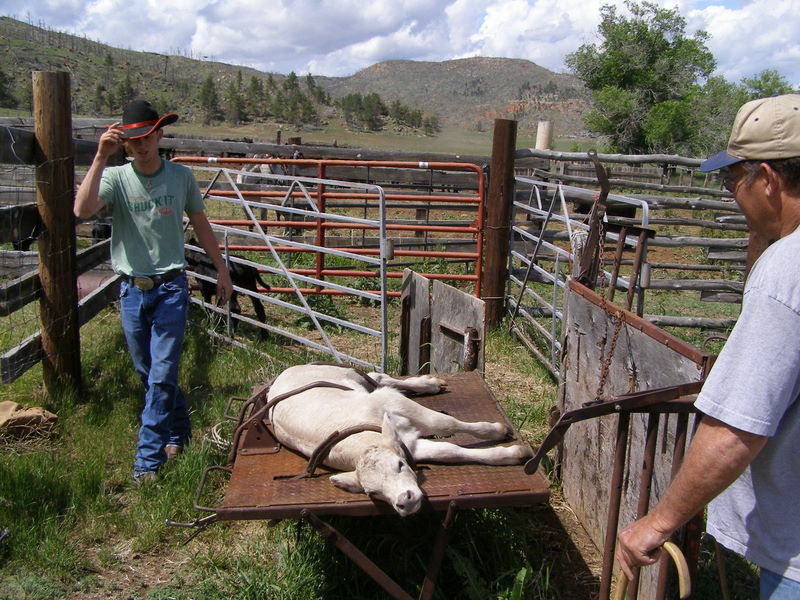 Sometimes we use the calf table instead of roping and dragging ’em. It’s usually when we don’t have a lot of extra help running around. Snowball doesn’t look stressed at all – she’s thinking she’s going to spend the day at the spa. Sorry honey, this ain’t no spa. A brand. A shot. All done. Just be thankful you’re a heifer calf, Snowball. 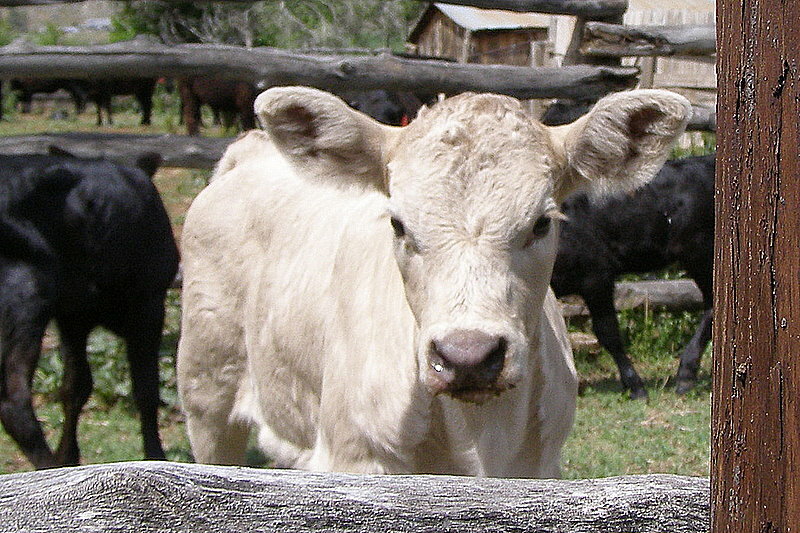 You don’t even want to think about what we do to the bull calves. Here’s a good look at our brand – even if it is upside down in this shot. It really shows up on that white hide.